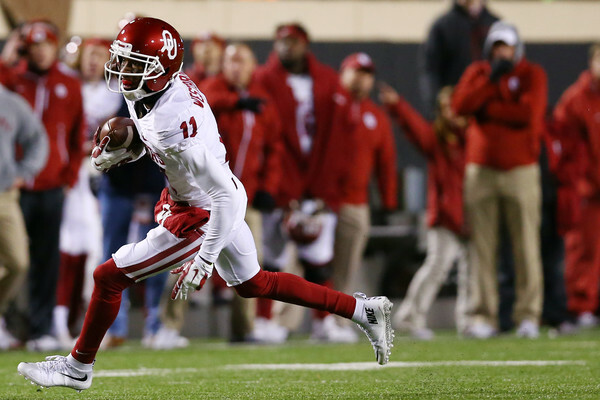 Oklahoma senior wide receiver Dede Westbrook has earned unanimous All-America status, becoming the 32nd Sooner to do so (ninth under head coach Bob Stoops) and first since offensive tackle Jammal Brown and running back Adrian Peterson in 2004. The American Football Coaches Association released its All-America selections Wednesday, the fifth of the five official All-America teams. Westbrook was named a first-team selection on each of the five squads. Organizations that name the other four official All-America teams are the Associated Press, Football Writers Association of America, Sporting News and Walter Camp Football Foundation. The 77th consensus All-American in Oklahoma history (consensus All-Americans need to be named to at least three of the five official All-America teams), Westbrook leads all Power 5 players in receiving touchdowns per game (1.33) while ranking second in receiving yards (1,354) and third in receiving yards per game (123.1). He also leads nation in receptions of 20-plus yards (26), 50-plus yards (7), 60-plus yards (6) and 70-plus yards (3). Of his 1,465 receiving yards, 1,311 have come in the last nine games, as have all of his school-record 16 receiving touchdowns. Slowed by a hamstring injury in the season's first three games, he recorded at least 100 receiving yards in eight of OU's nine Big 12 games and 88 in the other. Westbrook's 16 receiving touchdowns have covered an average of 48.8 yards, the highest average in the last 21 years among all FBS players with at least 12 TDs in a season. His 12 offensive TDs of at least 40 yards are the most in one season by an FBS player since at least 1996. Becoming a unanimous All-American is just the latest accomplishment for Westbrook, who finished fourth in Heisman Trophy voting, won the Biletnikoff Award as the nation's outstanding receiver and was named Big 12 Offensive Player of the Year by the league's coaches. Westbrook was one three Sooners on the AP's and FWAA's three All-America teams that were announced Monday. Redshirt sophomore offensive tackle Orlando Brown was named to the second team for both, while redshirt junior quarterback Baker Mayfield, who finished third in Heisman voting, was an FWAA second-team selection and an AP third-team honoree. Westbrook was the only Sooner on the AFCA's first or second teams.